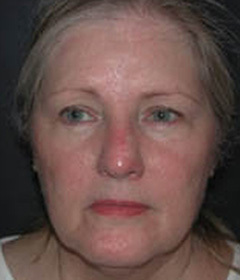 This 62-year-old female was referred to me by her dermatologist for reconstruction of a complicated defect on the left side of her nose. The day prior to her visit with me she underwent removal of a invasive skin cancer with a technique called Mohs. All of the cancer was removed but, she was left with a large, open wound that involved the left side of the nose including the skin and cartilage of the rim. Reconstruction of her nose defect required two operations. The first operation was done the day after the defect was created. 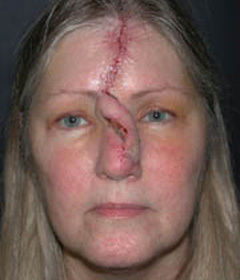 Under general anesthesia the skin from the middle of her forehead was transferred to cover the open wound on her nose. A piece of cartilage from her ear was also used to stabilize the rim of the nose. 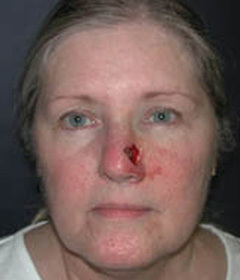 The bridge of skin between the forehead to the nose was left intact for three weeks. After three weeks she had her second operation where the skin bridge was removed. The tissue from the forehead provided the necessary tissue to replace the missing tissue on the nose. Her final pictures taken one year after the initial surgery shows a thin, faded scar on the forehead is hardly visible. The symmetry of her nose is excellent. She has no problems breathing thru her nose. She has some little blood vessels on the nose skin that could be improved with laser treatments. However, she wishes to cover these up with makeup. She is very happy with the results as well as the experience.